New 'Billions' Season: The Show About Power And Money You Should Be Watching It seems like the definition of 1 percenters' problems dressed up as a TV series. But compelling characters and the subtext make it a must-watch. 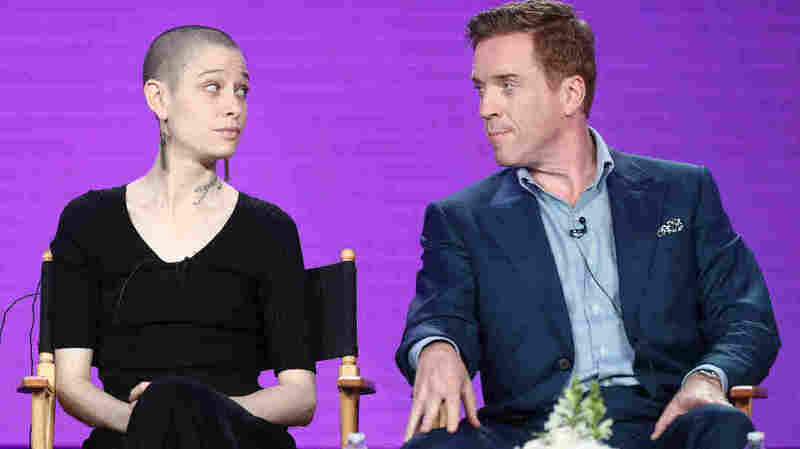 Actors Asia Kate Dillon (left) and Damian Lewis of the television show Billions speak during 2018 Winter Television Critics Association Press Tour in Pasadena, Calif.
Be warned: The review below contains plenty of spoilers about past and present episodes of Billions. The biggest problem Showtime's Billions has: It's a show that is way too easy to underestimate. At a time when income inequality and the struggles of the middle class are front-page news, it's tough to lionize a show about a millionaire U.S. attorney in an all-consuming personal and professional grudge match with a billionaire hedge fund owner. One guy, billionaire "hedgie" Bobby Axelrod (Damian Lewis), is a ruthless, self-made business titan who jumps on a private plane with his buddies to hang out with the band before a Metallica concert. The other guy, U.S. Attorney Chuck Rhoades Jr. (Paul Giamatti), is a scion of old New York money who bunks at the Yale Club when his marriage is on the rocks. This seems like the definition of 1 percenters' problems dressed up as a TV series. And yet, Billions succeeds, not only because it's a great drama about compelling characters, but also because it's the TV show about power in America that we all should be watching right now. For proof, look no further than Sunday's debut of the show's third season, an episode dubbed, "Tie Goes to the Runner." On the surface, it's a story about Axelrod's efforts to keep his company, Axe Capital, in business while fighting prosecution for illegally tanking a stock offering. As the billionaire works to stay out of jail, the U.S. attorney is covering up the unethical, and possibly illegal, means he used to goad Axelrod into breaking the law in the first place. It all traces back to the best episode of the show's run: last season's "Golden Frog Time." In that wonderfully crafted episode, we saw Axelrod break the law to crush a business deal backed by the U.S. attorney's father and his best friend, costing them millions. We didn't learn until the episode's final scenes that Rhoades Jr. had set the whole thing up. In the process, he threw away his father's fortune, his best friend's savings and his own trust fund (a scene where Giamatti seems to be laughing and crying at once, revealing his character's role in it all, ranks as my favorite TV performance in 2017). Still, despite of all the jockeying to hide their dirty tricks, Sunday's episode was really about something else. What do these men of great ambition and power — guys who consider themselves Masters of the Universe — do when they're forced to cede their authority to someone else? Rhoades Jr. is brought to heel by a new attorney general, Waylon "Jock" Jeffcoat, played with a Texas twang and deliciously blunt manner by Clancy Brown. Jeffcoat wants his U.S. attorneys to stop chasing more mundane financial crimes — the kind of directive you might expect from an A.G. appointed by a certain New York billionaire elected president, though Donald Trump's name is never mentioned. Axelrod faces a different dilemma. The government will only unfreeze his assets if he agrees to stop trading until after the trial, turning his newly promoted chief investment officer, Taylor Mason, into the public face of his company. Staffers in the U.S. Attorney's Office don't believe Axelrod will agree to it, until he does, to save his firm. "When it comes to billionaires — and Bobby Axelrod in particular — the thing you've gotta understand is that they are meat eaters," one prosecutor tells his boss. "The only win they can live with is total. Present and future. ... He expects to get all of it. Everything. That's who he is." And that is why I really love Billions. It gives us just enough material on the law and finance so we can understand the real story: how the personalities, passions and foibles of these men — and they are almost all white men — shape the world we live in right now. There are a few problems here. By depicting Axelrod and Rhoades Jr. so brilliantly in command of their worlds, the show does feed the fantasy that men of great wealth and power are usually the smartest guys in the room, which is not necessarily true. The lack of diversity here can be jarring. The most visible female roles are spouses: Axelrod's wife, Lara, played with fierce independence by Malin Akerman, and Rhoades Jr.'s wife, Wendy, a no-nonsense psychiatrist and in-house performance coach at Axe Capital played by Maggie Siff. Characters of color are mostly on the periphery. That is why the ascent of brilliant prodigy Taylor Mason, a nonbinary character who doesn't identify as exclusively masculine or feminine — played by nonbinary actor Asia Kate Dillon — is so important. I agree with other critics who say Mason seems to face remarkably little discrimination in a place as bro-heavy as Axe Capital, but it is good to see the show breaking diversity boundaries in one area, including by giving Mason a love interest in a future episode. For my money, Billions is TV's most compelling fable about wealth and power in modern life. And the quality of Sunday's Season 3 debut shows its story is just getting started. An earlier version of this story incorrectly named Martin Carlisle as the new attorney general character. The character is Waylon "Jock" Jeffcoat. In addition, the last name of Taylor Mason was incorrectly given as Morgan.